Let's have some fun. I've pulled out some early images of starlets in swimwear. How many can you identify? One star appears twice, can you guess which one? As they are correctly identified I'll fill them in. Along with your answer, make up a caption to go along with the image. Who's That Girl? 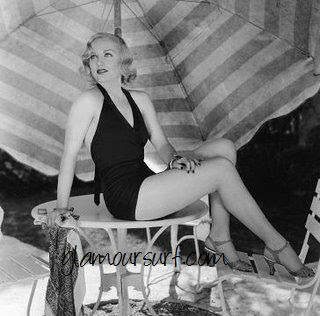 A. Jean Harlow correctly identified by Amy. "You want me to get wet? Are you joking? I look fabulous dry!" I. Olivia de Havilland correctly identified by Amy. 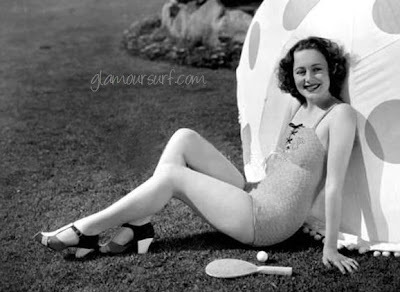 "Ping pong and polka dots--how ridiculous! But smile, smile, smile for the camera!" D is my favorite, Bette Davis! Thanks Jody, want to add a caption of what she might be saying or thinking? A. is Jean Harlow and I. is Olivia De Havilland--looking so cute! I think she's saying, "Ping pong and polka dots--how ridiculous! But smile,smile, smile for the camera! Correct on both, A+ for you! Aren't Olivia's shoes devine! You want me to get wet? Are you joking? I look fabulous dry! Correct on both B & K! Thanks! An actress. A couple of her movies included 'Lady in the Lake' (1946) with Robert Mongomery and 'Tension' in 1950 with Richard Basehart, Cyd Charisse, Barry Sullivan and William Conrad. I'd classify her as a B movie gal.